Germanna Community College spent $12.8 million in the Fredericksburg region in 2007-2008, according to an economic-impact study conducted by an Idaho-based consulting firm. Past students generate $228.4 million in income to the region, bringing Germanna's total economic impact to $241.2 million each year. That amounts to 2.1 percent of the area's total annual income. President David Sam presented the findings of Economic Modeling Specialists Inc. at a board meeting this week, saying they could be used to urge businesses and donors to invest in the college. "It could demonstrate that there is return on investment, that we are a good steward of the resources, that we are making a difference in the community," Sam said. Because most students are from the area, just $34,000 comes from spending by students who live outside the region. Germanna serves Fredericksburg, Culpeper and the counties of Madison, Orange, Spotsylvania, Stafford, Caroline and King George. Local purchases, including wages paid to faculty and staff. Students' contributions to area income with their education and work-force skills. About 95 percent of Germanna students stay in Virginia and contribute to economic growth. The study says the state saves $235,900 in avoided social costs each year, with savings in health, law enforcement, welfare and unemployment. Each dollar the college spends on students generates a return of $3.70 for the local economy over the course of students' working careers. Students, in turn, see their annual income increase by $153 per year for each credit they complete at Germanna. In a working lifetime, those who graduate with associate degrees earn $385,200 more than someone with a high school diploma. EMSI applied an economic model designed to find the economic benefits of community and technical colleges. According to a study released last week by George Mason University's Center for Regional Analysis, last year the University of Mary Washington contributed $115 million to the Fredericksburg region and $108 million to the state. Its total economic impact was $226 million. Eastern View High sophomores Heather Lister and R.J. Smith check a human simulator's heartbeat in Germanna's Virtual Hospital on Nov. 13. More EVHS students will visit today. About 50 Eastern View High School 10th graders from Culpeper will be visiting Germanna Community College's Locust Grove Campus today. Another group of EVHS students took the same tour last week. Along with receiving general information about the college, they will be getting a sense of what it is like to be a Germanna student. 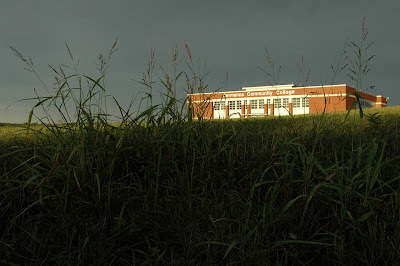 Germanna Community College will work with Stafford County Schools, the University of Mary Washington and other organizations to open the Stafford Academy for Technology for ninth-graders for the 2009-2010 school year. Academy instructional teams will include teachers for fields of study including Informational Technology, Pre-Engineering, Biomedical Sciences, Mathematics, Science and English. Parents and STAT partners got a preview this week at UMW's College of Graduate and Professional Studies. Colonial Forge High School’s Teachers for Tomorrow students who visited GCC Campus are enrolled in the SDV 110 course, Orientation to Teaching, which allows students to earn both high school and college credit at the high school. This new Dual Enrollment course developed by the Virginia Community College System and the Virginia Department of Education is being offered first at CFHS. Many of the CFHS students are also earning DE English Composition, Calculus, and Biology credits at CFHS through Germanna’s Dual Enrollment Program. In addition to SDV 110, Colonial Forge also added drafting courses to their Dual Enrollment Offerings this fall. During the campus visit, students learned about Germanna’s Education transfer degree program from Mark Haines, Coordinator of Counseling Services. Matt Mejia, Associate Dean of Admissions from the University of Mary Washington also provided information about how students can begin at GCC and then transfer to UMW to complete their BA or BS degree, while also earning teacher licensure. Dr. Frances Doloph from ODU spoke about transfer to ODU Teletechnet as well. Teachers for Tomorrow instructor Susan Easter accompanied the CFHS students. 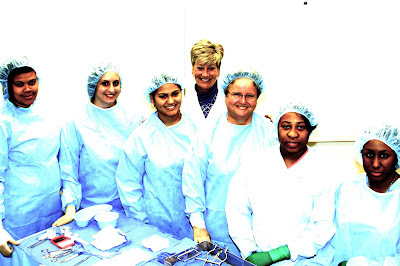 Surgical Scrub Nurse class consisting of Kaliefah Vickers, Lauren Przepiora, Elsy Hernandez, Nancy Beebe, Mae Brock and Shavonda Johnson, is taught by Jennifer Corwin. Germanna student Jillian Witkowski, right, works with, from left, Culpeper Regional Hospital Case Manager Deb Griffith and VP Janice Suter in this Star-Exponent photo. Germanna Community College students are applying their emerging nursing skills hands-on at Culpeper Regional Hospital. All of the students are part of the school’s two-year registered nurse program and will officially earn the title after passing a state exam after their two years of academic and clinical work. In addition to lightening the load on the regular full-time staff, the new nurses will help to reverse a nationwide shortage of nurses. “We’re very thankful to have students,” said Janice Suter, CRH’s vice president of nursing services. Industry experts point to many factors that have contributed to the nursing shortage. One is an increase in the volume of health-care services delivered to an aging population of baby boomers. Add to that shift work, long working hours and pay that isn’t always equal to the responsibilities and stress of the job and analysts say that it’s difficult to recruit young people and keep experienced personnel in the industry. But student Shanon Fleming said working toward being a registered nurse is the right path for her. “I enjoy talking with the patients, I like the fast pace,” she said. And after working as a nursing assistant for more than a decade, Fleming said that she wanted to take the next step in her career and education. For first-year students, who do clinical work four days each week, a typical day begins around 7 a.m. After arriving, students meet with instructors and find out which patients they’ll be responsible for that day. The students normally see a different patient each day, and their work varies depending on the needs of the patient. 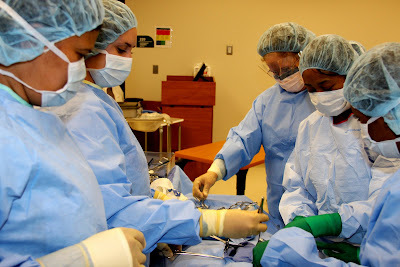 The students work in the hospital’s medical-surgical unit, an intermediate area that is one step below intensive care. They assist with many aspects of patient care including monitoring and documenting vital signs, giving medications, changing IVs, helping patients get dressed and groom themselves and most often, providing a willing and sympathetic ear. Each student’s work is monitored by the school instructors and experienced nurses. “A lot of people just want to talk,” said Jillian Witkowski, another first-year nursing student. “I’ve really enjoyed it,” she said. “I had no idea what to expect.” Although seeing someone different each day is difficult, she said it adds a unique challenge and appeal to the job. Clinical work continues for two years, throughout the RN program. During their second year, students begin working six days each week and may care for several patients at once. According to a 2005 report from the Virginia Hospital and Healthcare Association, the state will need more than 22,000 new nurses by 2020. To augment the ranks, the Virginia Community College System challenged its 23 schools to produce 80 percent more nursing graduates. About 70 nursing students graduated from the program in 2007, twice the size of the 2005 graduating class, according to school statement. A Germanna surgical scrub nursing class is preparing to work in operating rooms at area hospitals. Meaghan Gallagher inserted a syringe into a vial of medicine, careful not to withdraw more than she needed. "Now you see the difference between giving babies medicine [compared] to adults," nursing instructor Judy Hampton told her. Gallagher, 22, approached her patient, a toddler who wasn't particularly happy to see her. "Can I see your arm, buddy?" Gallagher asked the squealing child. It was Gallagher's first time doing the procedure, and Hampton, a registered nurse, stayed by her side. In the halls of the pediatric ward of Mary Washington Hospital, Gallagher's classmates--all nursing students at Germanna Community College--had their own patients to worry about. When they finish the two-year program, they'll help offset the nationwide nursing shortage. "That is a crisis that surrounds us in our community," said Jane Ingalls, director of Germanna's Nursing and Allied Health Programs. By 2020, Virginia will need an additional 22,600 nurses, according to a 2005 report released by the Virginia Community College System and the Virginia Hospital and Healthcare Association. The VCCS challenged its schools to produce 80 percent more nursing graduates to meet that need, Ingalls said. With an 88 percent success rate in graduating nurses, Germanna is at the forefront of those efforts, followed by Lord Fairfax Community College with 85 percent. Overall, the VCCS has a 70 productivity rate in turning out nursing graduates. "We are so excited about the success that our efforts of enrollment and expansion and student retention" have brought, Ingalls said. 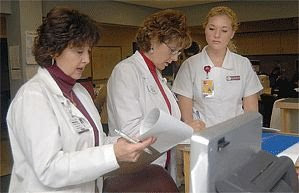 In 2002 to 2003, 817 students graduated from VCCS nursing programs, according to a press release. Last year, the number rose to 1,365. At Germanna, about 70 nursing students graduated from the program in 2007, nearly doubling the 2005 graduating class. The majority of Germanna nursing graduates work in area hospitals, and two new hospitals--Stafford Hospital Center and Spotsylvania Regional Medical Center--are opening in the next few years. "In order to meet the increasing demand, we're going to need more qualified teachers, and we need space," Ingalls said. When Gallagher graduates in May, she hopes to work at a hospital in the Fredericksburg area before finding a job at a children's hospital. She said she's not worried about the nursing shortage. "I think having a degree in nursing, you'll be able to find a job," she said. "There's always going to be someone needed." The shortage of nurses is a big time problem. the problem is because of education. they put too many people on the wait list in schools. its very frustrating. We admit as many qualified nursing students as we have qualified teachers, seats in classes, and spaces in assigned clinical settings. We do not keep waiting lists, but ask qualified applicants who are not offered admission to reapply for the next appropriate admission cycle. Germanna is currently engaged in an effort to raise funds for much needed expansion and renovation of our nursing facility and for the hiring of additional faculty members. If we can find community backing for this, it will increase our capacity for providing learning opportunities for students, increase the number of nursing graduates we produce even further and will help offset the local shortage of nurses. On Nov. 17, at Germanna's Fredericksburg Campus, University of Mary Washington professor novelist Steve Watkins will give a reading of his new work, "Down Sand Mountain," a coming of age story set in the '60s, published in October 2008 by Candlewick Press. The free reading will take place from 7:30 p.m. to 9 p.m. Nov. 17 at Germanna's Sealy Auditorium. Steve is also author of a short story collection, My Chaos Theory (2006, Southern Methodist University Press), which was a finalist for the Paterson Fiction Prize, and an Honorable Mention for the Library of Virginia Fiction Award. He also wrote the award-winning non-fiction book The Black O: Racism and Redemption in an American Corporate Empire, published in 1997 by the University of Georgia Press, which tells the story of the largest employment discrimination class action lawsuit in U.S. history. A graduate of Florida State University, Steve teaches journalism, creative writing, and Vietnam War literature at the University of Mary Washington. He also teaches Ashtanga yoga, and works as an investigator and advocate for abused and neglected children through the child advocacy organization CASA. He lives in Fredericksburg with his wife Janet, and four daughters–Maggie, Eva, Claire, and Lili. Steve and Janet are co-directors of the religious education program at the Fredericksburg Unitarian Universalist Church. Plow & Hearth founder Peter Rice talks about the elements that are critical to strong customer service. Peter Rice, founder of Plow & Hearth, is facilitating a group of area business leaders planning a Germanna Community College Customer Service Academy. The Academy to be offered by GCC's Workforce and Continuing Education program, will assist the region's business community in improving the quality of customer service. 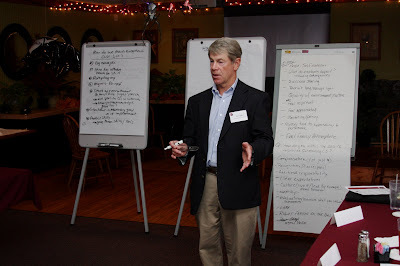 Rice provided insight into how Plow & Hearth became an outstanding customer-focused company. Among the local business leaders putting the Germanna Customer Service Academy are Rice; Bob Hagan of the Fredericksburg Chamber of Commerce; Bob Alexander, CEO ofPratt Medical; Brian Baker: Executive Director of the Rappahannock Region Small Business Development Center; M.C. Moncure, Stafford County Tourism Manager; Colleen Hairston, President of the Fredericksburg Hospitality Association;Russell Seymour, Director of Economic Development for Spotsylvania County; Tom Blalock of Union Bank and Trust; Judi Bartlett, Associate Dean of Instruction at Germanna; Sharon Clark, Owner of Cameleer; Susan Barnhardt, owner of Pepperberries; and Jim Charapich of the Culpeper Chamber of Commerce. Germanna Community College will honor all veterans, past and present, during a Veterans' Day ceremony at the college's Locust Grove Campus at 4:40 p.m. on Tuesday, Nov. 11. All students, faculty and staff are cordially invited to attend. Dr. Ann Woolford-Singh, Germanna Vice President for Academic Affairs, will speak, followed by Stephen Combs, Senior National Appeals Officer at the Board of Veterans Appeals in Washington. The event will close with members of Culpeper’s Eastern View High School Marine Corps and Junior ROTC clubs lowering the U.S. Flag, a tradition that signals the end of the duty day at all military establishments around the world. The ceremony will be followed by light refreshments in the LGC student lounge. For more information about the ceremony and Germanna's Veterans Club, call Joan Fischer at 540/423-9141. 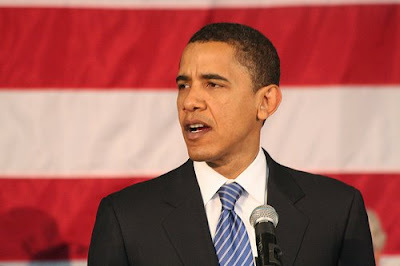 A record turnout by young voters may have put Barack Obama over the top. MSNBC reports that young voters preferred Obama over John McCain by 68 percent to 30 percent — the highest share of the youth vote obtained by any candidate since exit polls began reporting results by age in 1976. A fully refundable tax credit to cover the first $4,000 in college costs — enough for two years of community college tuition in most cases — for everyone. The only requirement would be 100 hours of public service a year; this could be performed in the summer or between semesters. A pledge to keep Pell Grant maximums rising at the level of inflation or higher if possible. COMMUNITY COLLEGES: Obama has proposed a new grant program that would provide funds to community colleges to conduct more thorough analysis of the types of skills and technical education that are in high demand from students and local businesses; to create new associate of arts degree programs that cater to emerging careers; and to reward institutions that graduate more students and also increase their numbers of transfer students to four-year institutions. Christina Aguilera sings "America the Beautiful" for Rock the Vote at www.germanna.edu. Virginia polls are open till 7 p.m.